and when I received short notice of the second test, we decided to go up a couple of nights early and enjoy some time as a family. Dan and I have been busy and preoccupied lately and have decided to make a concerted effort to play more. So on Saturday afternoon we headed up to Calgary with the kids. On the morning of my test, though, we were packing up our hotel room, suddenly overwhelmed again by weekday realities. Suddenly, though, George started laughing, pointing, and calling us over to the window. Olivia looked first, then Dan, and all three were laughing like crazy. I could not imagine what could be outside of an 11th story window that could be so funny but Dan said, ‘Karen you have to see this’. and she would not leave. The kids were absolutely beside themselves. We all were. 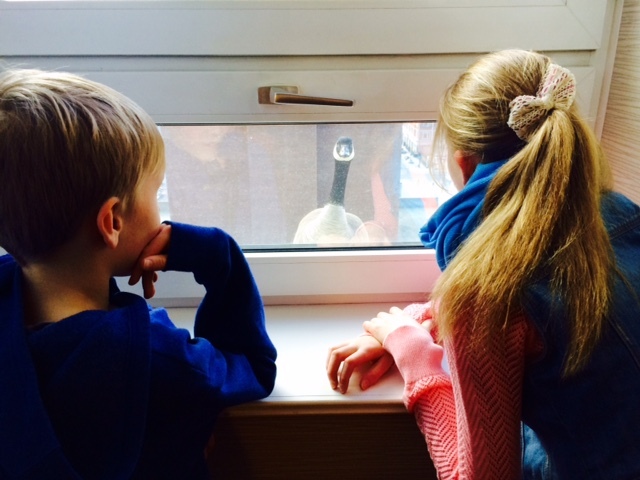 This goose was positively insistent that we notice her. wherein it feels pretty clear that we are being looked out for…. there is that sudden sense that we are definitely not alone, and that maybe the veil between worlds is a little thinner than we realize and there are infinite creative possibilities for communication and expressions of love. I have had many such moments, and this was one of those times. This silly and deeply comforting bird, or our Mother Goose as George affectionately called her, didn’t fly off until we all had walked away first, back to our business…. We calmly carried on with our day and all, of course, was well. 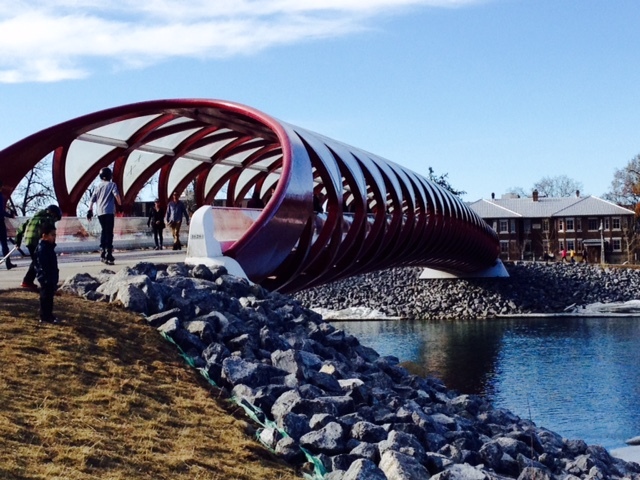 During our lovely aforementioned Spring walk, we came upon the much discussed new Peace Bridge. The Peace Bridge (great name!) 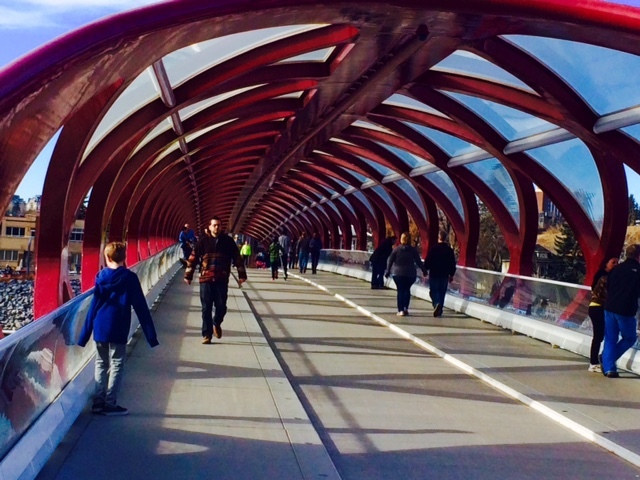 is a pedestrian bridge, designed by Spanish architect Santiago Calatrava, that accommodates both pedestrians and cyclists crossing the Bow River in Calgary. but while he’s analyzing the form and details of the structure, the English major in me is often busy creating metaphors in my head. bridges have been a frequent symbol in our lives as of late. Olivia is in the midst of a big project whereby she has to carefully construct a bridge out of toothpicks for science, and she was also just telling us that in class the other day her teacher had created a whole playlist of songs that included the word bridge. walking and working towards new situations, uncomfortably wedged in the in-between part. 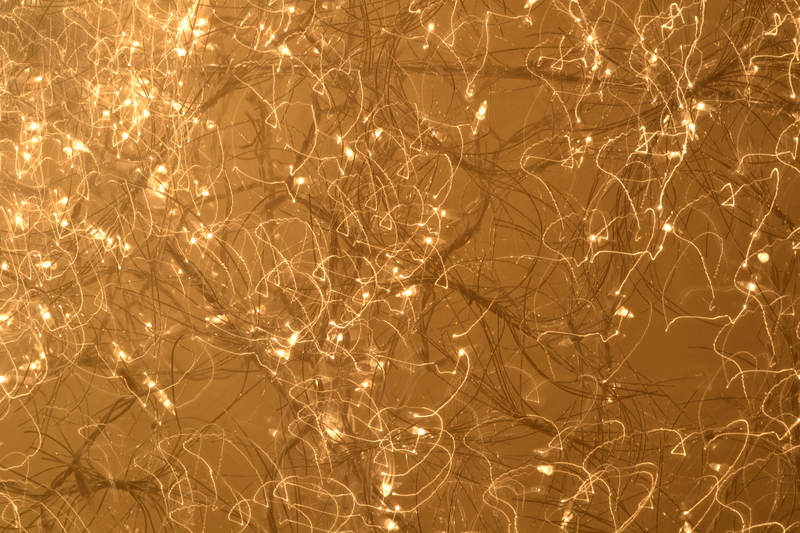 as change is ever-constant and life is always surely moving us to what’s next. and in the people moving by us on their Sunday strolls. 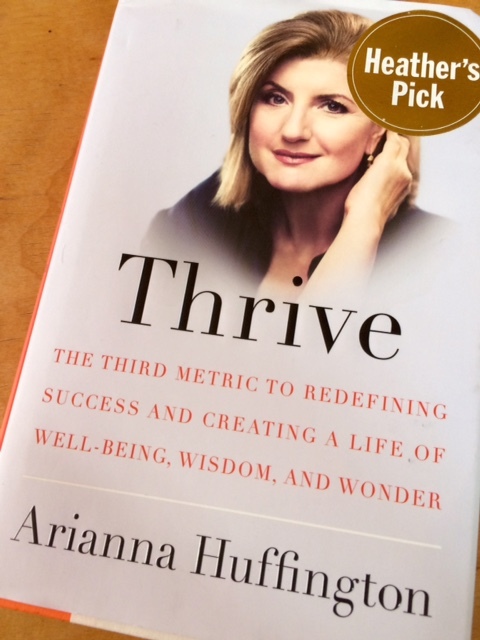 I have just begun reading Thrive: The Third Metric to Redefining Success and Creating a Life of Well-Being, Wisdom, and Wonder by Arianna Huffington. and shows us how the business world in particular must move towards integrating wellness for all. Sending you good thoughts and prayers. Loving the quote. But most of all, loving the very clear message from the universe (in the form of a goose!) that somebody Big has your back:).